Dr Laura Booi, PhD is a Gerontologist from Vancouver, Canada. For over the past decade her research has focused on improving the lives of those live with dementia, as well as those who support them. 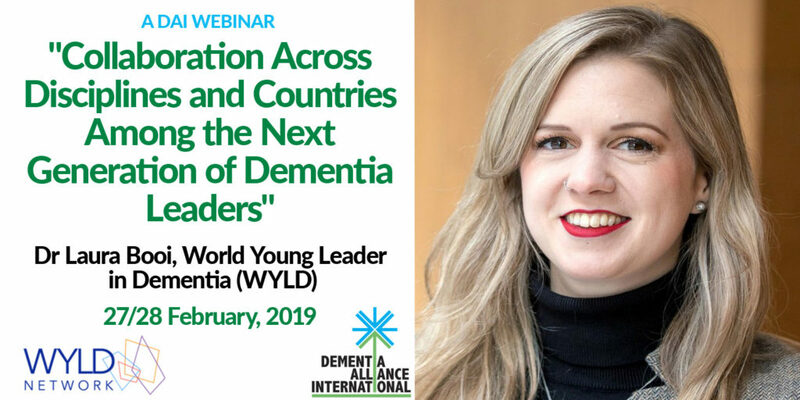 In our February 2019 “A Meeting Of The Minds” Webinar, she highlighted the work of the World Young Leaders in Dementia (WYLD). We thank Laura for her time, support of DAI, and expertise. This is a network of young professionals in the field of dementia. WYLD members represent over 300 individuals, under the age of 40, from 30 countries, spanning across 6 continents, who are working together across disciplines and borders to develop innovative dementia solutions. 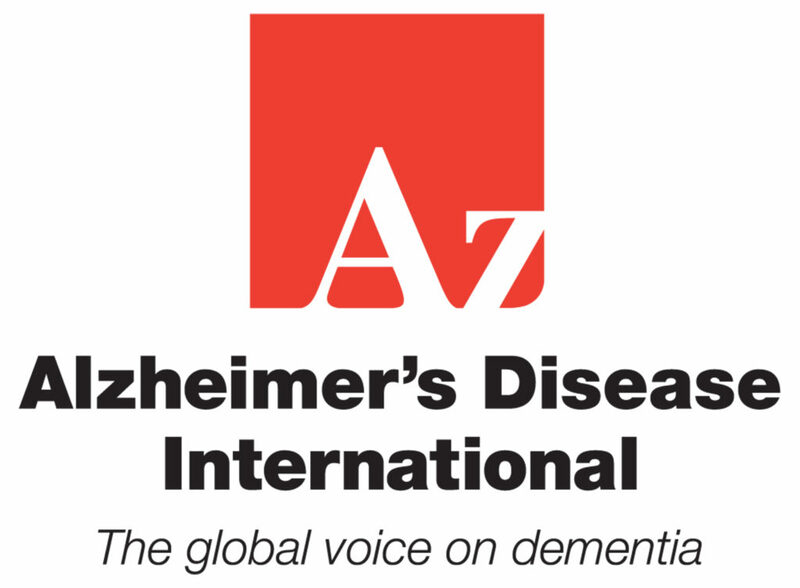 The network supports the work of the World Dementia Council as well as other NGOs. NOTE: This is one event in different time zones. Some people say that stopping driving is the “hardest thing” they face in living with dementia. Our research has explored people’s experiences related to stopping driving, the involvement of health professionals and key times when support is needed. The talk will draw on this to cover ways to prepare, decide and adjust emotionally and practically to life without driving. It will highlight ways to stay engaged in the community and in meaningful activities. It will also show advice for health professionals and family members for ways they can assist people who are retiring from driving. The CarFreeMe program is an example of an education and support program helping people with stopping driving, and we will give an overview of this and ways people could get involved. Jacki: Dr Jacki Liddle is an Occupational Therapist and Research Fellow. She is involved in researching life transitions, ways of supporting community engagement and ways of measuring meaningful outcomes. Her research with people living with dementia includes codesigning technology and supporting community mobility, particularly after driving cessation. Special thanks to Howard Gordon from the UK , for liasing with Paul Hitchmough who also lives with young onset dementia to be able to show the following performance at our ecent WRAD. The video also features dementia advocate Tommy Dunne who lives with dementia, diagnosed in 2009, and his lovely wife Joyce. It was produced by Crosstown Studios in 2018. This really wonderful song and its message is for all people with dementia. We are not, and should not be forced to stay invisible. 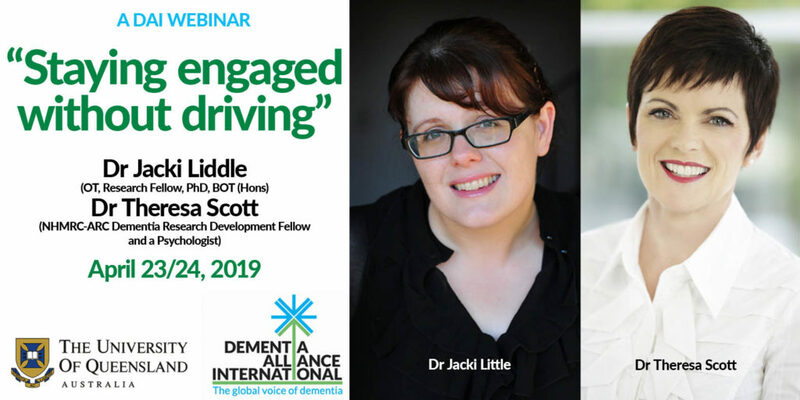 Yesterday, Dementia Alliance International hosted their second World Rocks Against Dementia (WRAD) online event, and together, we ‘ Rocked the World Against Dementia”! This image of Graeme Atkins, taken at an event some time ago, highlights his ongoing love of music, and we thank him for agreeing once again to open and close our WRAD event with two live performances, albeit via zoom! 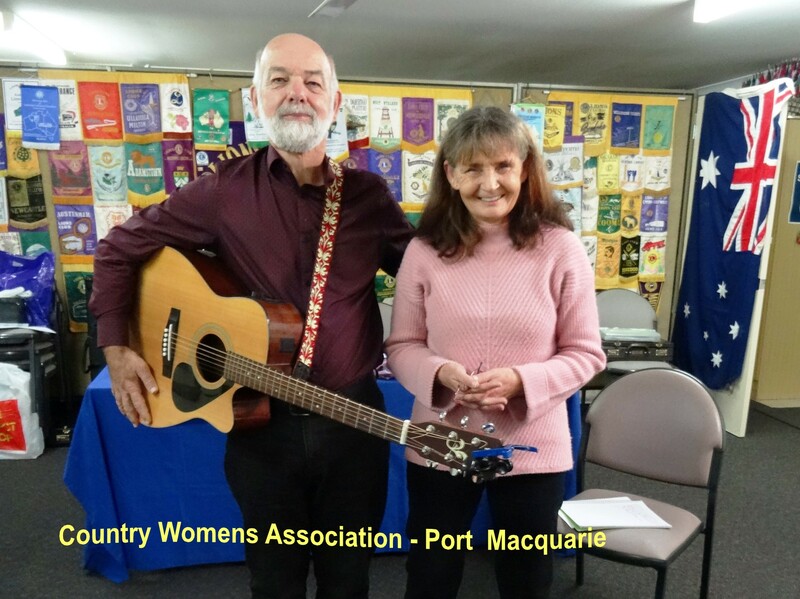 The event was hosted by our Vice Chair Jerry Wylie from the USA, and Board member Christine Thelker from Canada, who did a fantastic job, and also made sure we have fun. Mike Belleville from the USA, also a board member was once again our producer. We thank them all for their hard work to put this event on. DAI also sincerely thank all of the performers, who either performed new songs for DAI’s WRAD2019 event, or gave their consent to use a pre recorded performance. The Non Communicable Diseases Alliance (NCDA) has prepared a survey to understand the community’s priorities when it comes to universal health coverage (UHC). This is in advance of the first United Nations High-Level Meeting (HLM) on UHC, which will be held in New York on 23 September 2019. Dementia was not even mentioned at the HLM in September 2018, so it is becoming imperative for people with dementia to have their say. Please therefore consider completing the survey. People with dementia are as entitled to Universal Health Coverage as everyone else! The results of this consultation will feed into broader advocacy efforts being conducted by UHC2030 and the civil society engagement mechanism, which are leading advocacy for the HLM on UHC. NCDA’s approach is to highlight specific areas in which the NCD community can bring added value to the discussion ahead of the HLM on UHC. We hope by specifically inviting people with dementia to participate in this survey, the NCDA will ensure dementia is mentioned in its own right, and becomes a priority too. Please complete this online survey by Friday 29 March. You may preview the survey, to facilitate consultation and help formulate their responses. The survey will take about 15 minutes to complete, once you have developed your responses. Previous PostRecognising Christine Bryden on International Womens DayNext PostGetting in the mood for WRAD2019! Christine Bryden was diagnosed with dementia aged 46, a single mother of three beautiful young daughters. Watching the video presentation today given in 2013, highlights very little has changed. In fact, in Australia, there is currently a Royal Commission in to the quality (or rather, lack of quality) in Aged and Dementia Care. 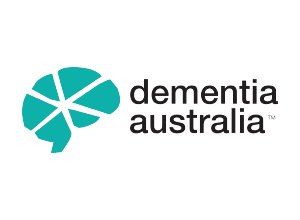 However, today, on International Women’s Day, DAI wishes to recognise and acknowledge the incredible pioneering work of a remarkable woman, Christie Bryden, an extraordinary Australian woman who has been living positively and productively with dementia for well over two decades. Thank you Christine for being someone we can still learn so much learn. 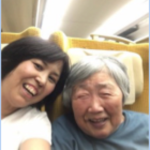 About DAI’s online WRAD2019 event: DAI ‘s vision is that all people with dementia are valued and included. We also have a strong philosophy that working together makes us all stronger, and by doing so, we can and will achieve more. 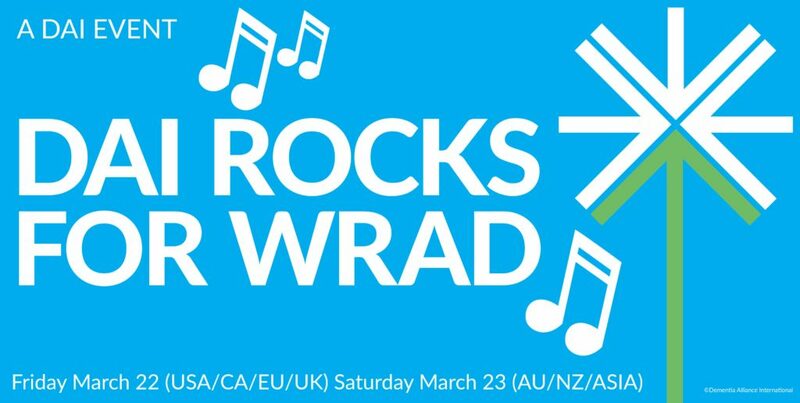 Our 2018 “World Rocks Against Dementia” (WRAD) event was hugely successful, and we are hostig another online event for WRAD this year. This year, we have many new and original songs, performed just for DAI’s Rock Against Dementia online event, and we thank each and every performer for their support. Many of these songs will really speak to your hearts and souls. We don’t have a fully finalised program yet, but please know it will be fun. We have some live performances (yes, via Zoom), and like last year, there will be time to chat and ask questions about what is it like living with dementia along the way. 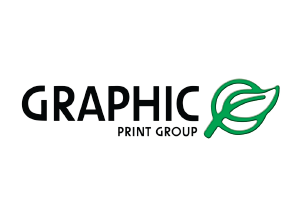 Credit goes to Wayne Mesker who started Rock Against Dementia (RAD) in the USA, and Norrms McNamara in the UK whose idea it was to take the event global. By collaborating together, these two men have helped the World Rock Against Dementia (WRAD) all around the world. DAI is proud to be part of the movement, as we all know music is an important part of our lives, and as discovered by the Alive Inside Foundation, is also a powerful change agent for improving the quality of life, memory recall and pure joy for people with dementia. 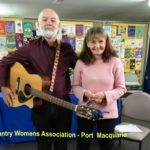 Opening and closing live performances are again by DAI member Graeme Atkins, who supported by his wife, is a wonderful example of living positively, alongside the very real challenges of a diagnosis of dementia. Live performance by Graeme Atkins: The Minimal Mental Test! The huge misunderstanding is that the person with dementia has no understanding. Discussion about the end of life medical approach and the care. Theme: Who should make decisions at the final stage of life and how? From the perspective of the person living with Lewy body dementia.” yomi Dr. Yomiuri Shimbun Holdings, 15.12.2016. Available in Japanese here here. 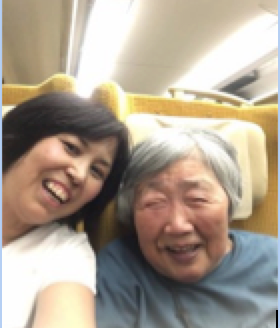 DAI is delighted to share this article about dementia and end of life issues, from the perspectives of Naomi Higuchi, a person living with lewy body dementia in Japan. “Who should make decisions about end-of-life care when we are diagnosed with dementia? My answer is clear that it is the person himself or herself. Then, when should it be done? Probably before the person loses the ability to do so. It is the only way to relieve those around the person, including loved ones and healthcare professionals, from the emotional conflict that may last even after the person’s death. It is difficult for anybody to contemplate the loss of their loved ones objectively or calmly. No matter what they have chosen, the feeling of doubt will remain whether one has made right decision. The more medicine develops, the more this feeling will increase. The evaluation of the decision between too much and not enough can only be made by the person who lives the life. In terms of the end of life care of people with dementia, there is a strong negative image that those people are “kept alive without any understanding of what is going on.” But is it really true? It may be that people simply assume that persons with dementia do not understand anything, and therefore they do not even think of asking them what they want. My grandmother had been bedridden at home for a long time. Even when we were told that “she cannot recognize her family anymore”, she still smiled at me and said, “Hi, Naomi…”. However, eventually such responses decreased, she lost words and facial expressions, becoming something like a stone. No one could tell whether she still had emotions or not. This situation made me feel something similar to grief at her death. However, one day when my mother was with her, my grandmother suddenly opened her mouth and said to my mother, “I am sorry for being a burden to you. It won’t last long, so please forgive me.” Her lack of responsiveness did not mean that she did not understand anything. Every time when I visited my grandmother, I let my little children hold her hands and talk to her. Although we could not see her response anymore, I believed that she still felt something inside her with our visits. She became a great teacher to my children by showing them how people as human beings age, suffer from illness and become increasingly vulnerable towards the end of life. My grandmother passed away slowly and calmly, surrounded by her loved ones at home. It seemed that she finished her life with no pain, no worries and no fear. I felt that she returned to a vast place beyond time and space. I felt a strange sense of relief to think that all creatures including myself will eventually go back to that place. Death is a natural process. It is not a tragedy, defeat or devastation. The thought that death was a part of the fundamental workings of all creatures, nature and the universe, calmed and comforted me. Being diagnosed with dementia does not mean that the person suddenly loses all cognitive functions.Illnesses give us the opportunity to think about our life more seriously. After I was given the diagnosis of Lewy Body dementia, I deeply thought about what I can do, what I want to do, what I should do and what would give me satisfaction the rest of my life.Many small concerns and worries which do not relate to the core of my life disappeared when I thought I might not remain in my current condition next year. I decided to spend the rest of my life time building social awareness of dementia. This challenge made my life fruitful, and it seems that an enriched life has promoted the well-being of my brain and all my body cells. Through my advocacy activity, I came to meet with people who conduct ideal medical and care approaches. After my conversations with them, I can now declare with confidence that it is a complete misunderstanding that people no longer recognize anything when they have dementia. 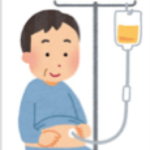 I heard directly from a family member whose father (82 years old) clearly said that he wanted to have gastrostomy if it was going to improve his condition. People around him including the family were really surprised as they had thought that he was no longer capable of making decisions regarding his own treatment, due to advanced dementia from Lewy body disease. A care method called “Humanitude” has been developed in France by Yves Gineste and Rosette Marescotti. The methodology applies a multimodal communication approach to convey respect for the dignity of the person. Mr.Gineste, Director of Institutes Gineste-Marescotti and Visiting Professor at Kyoto University, told me face to face that his father, who had Parkinson’s disease, could walk until the day before he died, which means that with appropriate intervention, people can maintain their ability throughout their lives. With the use of adequate care techniques, people who may appear to be extremely aggressive become quite calm, elderly people who were bedridden can start walking with assistance, and their contracted joints can be stretched again. 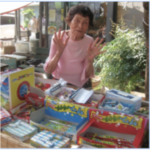 Picture: A lady who was cared for by the staff in Aoi Care until she passed away. 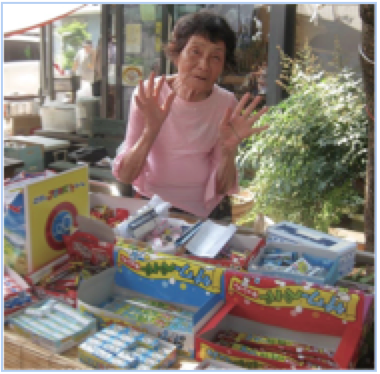 She enjoyed the role of selling snacks in a community event. Both Gineste and Kato say, “Even if people have dementia, it is possible to have affectionate communication with them until the end of their life.” I believe that this is not a miracle that could only be accomplished by people like Gineste and Kato, but it is possible for anybody only if they make up their mind to face each person with real respect and affection. However, it is never too early to think about the end of one’s life and write down advance directives. This should be done with sound knowledge of the advantages and disadvantages that the choices such as gastrostomy would entail, not based on vague impressions. I used to have a very negative image of gastrostomy because I have seen people with gastrostomy in a nursing facility during their meal time. A nurse went into a room where 6 people were lying in bed in postures that looked uncomfortable and distressed. The nurse connected a big bag, which looked like a medication bag for intravenous feeding, to each person’s gastrostomy tube. She came in and left without saying a single word. I felt the way she treated the people was cold and cruel. However, if I were to develop a Parkinsonism as a part of Lewy body dementia and have difficulty swallowing from the early stage, I would definitely choose gastrostomy to take in enough nutrition, water and medication, and continue to go out and participate in activities as I do now. 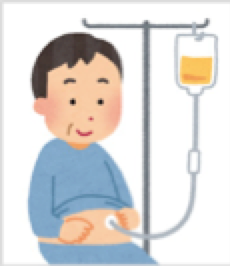 (Some people in the early stage of the disease may have to use gastrostomy even when they can walk on their own.) I could continue to eat my favorite food with my mouth even if the amount is less. The meaning of gastrostomy can be very different depending on the user’s stage and condition. If we have this kind of knowledge and make decisions with the correct understanding, we will have less chance to regret. Everybody should regularly take time to write down their own wishes for the end of life. Everyone is at risk of having an accident or illness that could affect their speaking abilities, such as a car accident or stroke. I recommend everyone to write down their wishes for their end of life in advance, for example, when they renew their driving license, when they get their annual health checkup or when they see their primary care physician. If it becomes a routine for everyone, we can avoid the situation in which the family must suffer from the burden of making medical decisions when the person is unable to communicate. Some local governments in Japan encourage their residents to write down their medical information and keep it in the refrigerator at home so that emergency staff can find it easily. I think this is also a good place to keep the advance directives. Thinking about our own death should enrich the rest of our life and make it more meaningful. Biography: Higuchi was born in 1962. She was diagnosed with Lewy body dementia at the age of 50. Until then, she was misdiagnosed with depression and suffered from the side effects of inappropriate medications for 6 years. In 2015, she published a book called “What happened in my brain” (Bookmansha). 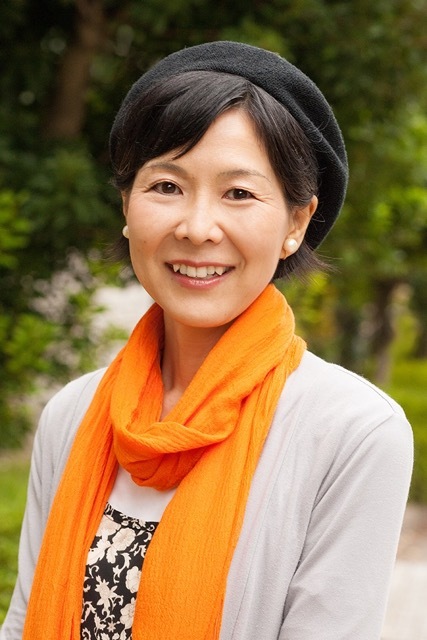 For this book, she won the 2015 award of the Medical Journalist Institution of Japan. The book is based on her diary over a 2-year period before and after the diagnosis. It was all written by herself without the help of a professional writer or an editor. Higuchi is invited to give lectures in universities and academic conferences, such as the Japan Society of Dementia Research. She also continues to write short articles for a column in the medical website of a major newspaper company. As of October 2016, she maintains her capacity for logical thinking, even though she may occasionally suffer from various brain dysfunctions, such as space cognitive impairment, hallucinations and autonomic neuropathy.